I really liked #2 – give yourself grace. That’s sometimes the hardest part for me. I can see all the things I *could* be doing, but in reality, they aren’t the BEST things I can do right now. I’m learning there are truly seasons for everything. What I can’t do right now (like host a mom’s group) doesn’t mean I won’t ever be able to do it. I’m in a season (of two very little children). So keeping my priorities straight and learning to say no really helps. 3) Facebook – I just need to let it go today! Yes, yes, yes! Love the wisdom in this comment! 2) elaborate dinner–decided to make a crock pot meal instead! 3) starting school preparations–I go back next week and need to start making power points. Will start tomorrow instead! Today is a paperwork, filing, organizing kind of day…wouldn’t want to ruin my flow! 1. Leaving the house. It’s frigid and I’m doing a 14 Day No Spend Challenge. Not only is it safer to stay in the warmth, I can make sure that I don’t spend by staying home and enjoying the day with my family. 2. Working all day cleaning the house. 2 of the kids are home so it’s a great day to play. 3. Phone calls. They can wait a day or two. 1. Going out to do a dozen chores. This is the last day of break for my kids. We are playing board games instead. 2. Mopping. I have teenagers that could earn some extra chore money. 3. Dusting can wait. It will be there tomorrow. I love the grace point. I started practicing it last year with everything and I have been more happy but I still have a hard time with me. So this is where I treat me as I would treat others. My husband just brought this up to me the other day and now I am reading it here. He asked if I can try and get everything done (cooking, cleaning, blogging etc) by 6pm. He likes to come home and just spend time with the family watching TV etc. Even though I have a schedule I try to go by, I usually find myself getting into a blog post or still doing laundry at 8 pm. The kids (10-12 yrs old) are usually doing their own thing in their rooms. I guess it is meant for me to slow down a bit and just enjoy family time 🙂 Thanks!! This might not work for all families, but it’s working really well for our family at this season of life. 1. Exercising-was going to run this morning, but I have already worked out for 6 days and I needed some extra sleep! 2. Going to the grocery store-it is freezing here and I don’t desperately need the items on my list. 3. Cleaning out closets-my kids are home due to the weather and it can wait for another day. I like the point about Giving yourself Grace. I’ve gotten better of the past several years about saying no, but it is hard for me not to beat myself up about getting everything done. I truly need to work on lowering my expectations. I gave myself the day off from exercising yesterday, too! It felt really good to have a rest day! And way to go on six days of exercising! 1. I went ahead and let a church committee know today that I won’t be help plan an upcoming event due to my work demands. 2. Keeping off completely after I pick the kids up from school today- my afternoon and evening will be for family time. 3. Put off errands until tomorrow. It’s bitter cold here and the things I need to do can wait. Facebook can be such a time-sucker, can’t it?! This is good advice, but your list sounds like you made some stuff up in order to cross it off your list. Who puts “time consuming dinner prep” as something they want to do? Doesn’t everyone want to spend less time making dinner? I love making a time consuming dinner!! 🙂 It’s not fun or relaxing if you don’t have time to let the bread rise, etc. But, cooking a wholesome meal with some music playing, kids hanging out together, and husband coming home to a yummy smelling house is one of my favorite things in this world! So many other nights we have to rush because the kids’ activities all happen at about 5ish and run to about 8 – so a night at home with a time consuming din din sounds great! 1. I am putting my phone down at 7. No / or any social media. I need and want to spend time with my husband. Our relationship needs us time. 2. Picking up the kids toys, one day of no clean is well deserved after two weeks of school vacation. 3. Give the dog a bath, it can wait one more day. Oh, I love the “putting down my phone at 7” commitment! As an ‘older’ woman’, whenever I see another woman who appears to have everything together, I am suspicious. After raising five children and homeschooling for 23 years I can tell you that you cannot do it, at least for not very long. I have perhaps gotten too much into the habit of cutting myself some slack! I think this will leave time to start up my read alouds, prepare a wholesome meal for my family, and line the cabinet with shelf paper under my sink. I have learned so much from you the last few years, and I am determined to be more goal oriented. I said no to a monthly obligation last month. It was hard to do, and I had a lot of guilt, but now I feel so free!! 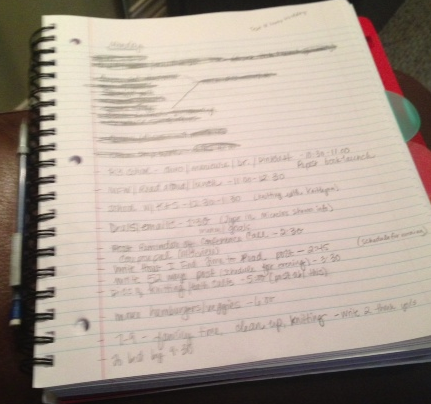 I have avoided making lists…they make you accountable!! But, I am giving it a try. Beginning today. Thank you for the encouragement! Crystal, I have a question that may not be appropriate for this… but I need to ask! I know that you homeschool, so do I. I am wondering how you stay online throughout the day and school the children?? I would love to be able to build my blog and work online while schooling. How have you made this possible? Do you set time limits for yourself and pop off and on throughout the day? I also want my time in the evening to be spent with family and doing other wonderful things! I have been doing that… but I also feel like I am not getting enough done. Can you pay a mother’s helper? Crystal has several employees. I’m so grateful for them as I couldn’t do what I do without them. I get up early and usually get in 2-3 hours’ worth of computer work before our homeschool time. In that timeframe, I schedule quite a few posts/Facebook posts, etc. to run while I’m homeschooling. And then I “hand off” the blog to my team to oversee while I’m homeschooling (They moderate comments, post deals, remove/update deals, moderate Facebook comments, etc. — anything you see posted here or on Facebook as “MSM Team” is my team, not me.). I sometimes pop on to check email or comments if I have a spare minute here or there during homeschool time, but for the most part, I’m offline during the middle of the day. And then I hope back on for a few more hours’ worth of work in the afternoon/before dinner. I usually schedule the evening posts/Facebook posts then so that I can be offline most evenings, too. I love the ability with WordPress and Facebook to schedule posts in advance so that my blog still runs when I’m offline. If you can find a few blocks of time during the week to write posts/schedule them, you can work ahead so that you can be offline while you’re homeschooling. This does help a lot! I wonder, did people help you before you were able to pay them??? Or did you start small with their pay? Thank you for the time you take to answer and comment! The income has grown as the business workload has grown, so that’s been a huge blessing in allowing us to continue to grow and bring on more people. I started very small in hiring help… first, it was a mother’s helper for a few hours per week and a person to help me with tech stuff and blog graphics for a few hours per week. As the business grew, I’ve slowly brought on more people or increased the hours of those who are already working for me. It’s like you can’t say “yes” to the things that matter, without also saying no to things that aren’t priority. So a no to something is a yes to something else! I learned to say “no” a while ago when I was commuting 45 minutes each way for work and sometimes had to work until 8p.m. or later. I had a strict rule that I did not make commitments for more than two nights in a week, including working late. My standard line to say no is: “I have another commitment that night/day/whenever.” That other commitment is to my sanity and family life. I said no to my book group for this month, which is really saying no to three things at once: getting the book, making time to read it, and going to the meeting. Doing so will make my life a lot saner this month. Perhaps I will rejoin them next month. 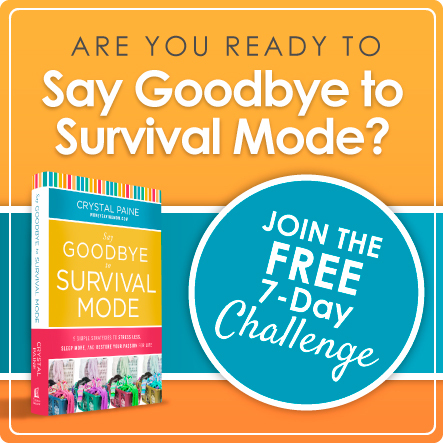 I love that you are encouraging moms to say no. Just reading that in your new book was so refreshing…it’s like I never even considered saying no before because I thought I had to be that likable person who always helps out, sometimes I just think I have to be involved so that I know what’s going on (yes, I’m nosy!) with everything and everyone. 1. Taking down the Christmas decorations. I usually have them all down by now, but since it was a short season this year, I’m leaving them up to enjoy a bit longer. I’m not going to stress over it. 2. Staying off Facebook. I wasn’t on FB as much the past few weeks because we had company staying with us, and I found that I felt a lot happier and not so anxious to find out what was going on with everyone. 3. Tonight’s PTA meeting. I’m going to stay home with my husband and kids and enjoy them instead of a boring meeting. 1. Leaving the house. Last night I told my daughter that she could drive the car to school (a real treat since we are a one car family!) This forces me to stay home and work on my eBay business. LOVE the crockpot for easy dinners! Wow, what a great idea. However I really struggled with the Homework portion. I made my list and just stared at it, unable to choose anything to cross off. In fact I thought about adding things to my list just so I could cross them off. But that would be cheating. So I finally got bold and crossed off some very important things for tomorrow. Grocery Shopping- Why drag my almost two year old to the store when I can send my Husband my list and have him swing in and out on his way home? Unload Groceries- If I do this tonight it won’t need to be done tomorrow. Start a blog post scheduled to go up Thursday- I’m already planning to work on another post tomorrow why add more on my plate than I have to? What a great exercise! I can’t wait to participate in the rest of the challenge! Thanks Crystal. Great points Crystal. I absolutely love the idea of making a t0-do list and then scratching off stuff. Especially since I’m really good adding more than I can usually handle. I am not going to worry about laundry, I also will turn the computer off by 6 and spend time with my kids, and I will not worry about getting any dishes done in the evening. Thank you, Crystal! Your post made me realize I have been pressuring myself these last few days. Late last year I decided to start a blog. And while I have a bit of content written and ready to post, I felt I needed to have more. That is the first thing crossed off today. No blog writing. I have enough for now. The other thing I have crossed off my list is planning out my goals. I have identified these and have developed them enough to the point of being able to work on them the next few weeks. Why fret over listing what I need to do next month? Finally, I too changed my dinner menu 🙂 I wanted to make my first crock pot meal today. It would be perfect for -15 weather! I didn’t realize, however, that I don’t have what I need to make a specific recipe. I decided to make something else for dinner. Why risk going out in this weather just so I can say I did everything on my to-do list? I love this and I hope it brings more margin and peace into your day! Here’s my post about what I’m saying no to. Go you! I’m so glad you’re participating! YES! I so know this feeling! 3) a magazine subscription- the renewal process is actually daunting and I’ve decided I don’t really need it that badly because I already receive plenty of magazines! Yay! I especially loved the last one! You’re inspiring! Vacuuming, loading and unloading the dishwasher, and dusting are ones I don’t like to do, so I could just not do them tomorrow! This was actually difficult as tomorrow is an easy day for me. My husband is sick and I’m not so I was just going to stay at home and do housework/relax with him while my daughter is at school. However, I did find three to cross off! 1. Do both of my goals for Swagbucks. I have been doing the larger one but I’m just going to do the smaller one tomorrow (click through videos on mute) while my husband and I watch a movie! 2. Clean as much of the laundry as possible. I am just going to do a load of my husbands “contaminated” clothes. 3. Clean as much as possible throughout the house. I am just going to wipe up downstairs/vacuum the main areas that need it and worry about it later. 3. Working on my blog any more tonight. Instead I will focus on spending time with my two little girls and getting a hour meal on the table for dinner. Whoops meant to say hot not hour. Dang auto correct. We like to stay home a couple of days a week. It brings sanity to our week for sure. I know it’s not for everyone since I have a friend who texts to get together every single day. I am saying no to writing a newsletter that I can delegate out. I am saying no to checking Twitter this whole week. I am saying no to going online after the kids are in bed. Okay, I’m feeling good about this already. This weekend I determined that I am worn out as a spouse caregiver for the last 2 months at home and the previous 8 months at hospital, skilled nuring facilities, etc. I cannot be the lone soldier. A dear friend has helped me at least 3 days a week or more, but I am at the point all I want to do is rest, my temper is short and so is his. I will have to find a way to pay for an additional caregiver whatever it takes or else I too will end up in the hospital. You may have local resources than can help you with caregiving. If you are in the right age group, your senior center and elder services can be terrific help. In any case, your local visiting nurse can provide a housekeeper, or a nurse’s aid to help with things like showers at a cost that may be more reasonable than you think. Also, consider a respite visit at your local nursing home. I hope you can get some help and get a break for yourself. It is NOT easy taking care of someone especially on your own. Wow, this came at the perfect time for me. 1) Just today I already said no to volunteering for a committee for next year…one that I’ve done for the past several years and I’m burned out and over it already. I’m so over it I need a new word for “over it”. I’ve been SO scared of saying “no” because I don’t want to disappoint people or my kids (I want to be a “good” involved mom). I’m perfectly capable of doing the work, but just can’t mentally handle it anymore, and it’s hard for others to see that when I hold it all in. 2) I’m saying “NO” to the guilt associated with #1. It keeps creeping up on me, and I have to keep squashing it down. This is getting easier as the day goes on. 1. Today was a teacher “work day” at school. It was filled with meetings and planning a new intervention program. I had a huge list of things I needed/wanted to do in my classroom. I let it go. I decided I could break those tasks into smaller chunks and eventually get them finished without stressing myself out doing it ALL in one day. 2. The Confident Mom Planning chart is now prominently displayed on my fridge. I started using it last week and I love it. However, I learned quickly to give myself grace when I didn’t check something off for the day. It’s okay to bump something to the next day or Saturday when there’s more room in the schedule. 3. Technology…reading the news on-line, checking Facebook, and reading through personal emails. The world can wait! My goal this year is to say “yes” to family and “no” to things that are fleeting. I’m trying to stress less. I hope this will help. I crossed off Mopping, my sister lives with us and can do that! Joyful Post it was on the list twice oops. And Giveaway post because I don’t plan on starting it till later in the week anyways and will have more time! Your post was challenging to me. I struggle with feeling like I *should* be doing more than I am. I’m sure part of it is a comparison thing and a guilt thing. Yes, I need to give myself grace. Thanks. 1. Grocery store stop – I can either wait another day or ask my hubby to pick up a few things. 2. Clean the bathrooms – Yikes! 1. Facebook–If I need to read something I can “snack” on Scripture. I’ve been trying to implement this thought process into my life. What a great time! 3. Clean out my closet-It will still be there tomorrow. I have been feeling lately that I need to say no to many household/school things right now and really focus on my children. They need my undivided attention in some character training right now, especially my 5, 4, and 2 year olds. This will definitely be an area I work on all year long. Today, I am off work so my saying no centers around saying no to home items. 1. Reconciling our December finances. I actually really enjoy number crunching, but there are other more important things to do today, so this can wait. 2. Pressuring myself to finish my current knitting project. If I have time to to work on it, I will. But I have let go of the pressure of finishing today. 3. Starting a new Scripture memory project. I will review the old one and start a new one later this week. 1. I skipped kid baths. They aren’t going outside and school was canceled for Tuesday. 2. I didn’t get on the phone or internet. Of course my phone line was down, so this was kind of out of my control anyways. 3. I didn’t worry about getting all the laundry done. It will be there tomorrow. My things I gave up doing today! 1. Starting more laundry, I need to catch up on what I have done so far. 2. Make my salads in a jar for lunches. I can make them this weekend for next week. 1. Making an elaborate dinner-this is hard for me! But so worth it. 2. Checking the mail-we have to drive to our apt mailbox-too cold yesterday! Thanks for this!! Its nice to be reminded to give myself grace. I’m really enjoying the call tonight. I hope it will be available so I can relisten to it again and again. I am always so worried that people or even my husband will think I am lazy if I don’t do everything. Something in this call and this post is clicking with me so I can adjust and reevaluate what my priorities are. 1) I worked as a nurse and a mom today, so I decided to give up any time spent on my side job in direct sales. 2) I chose to not follow my 0415 wake-up call. Gave myself some extra sleep time. I really LOVE good sleep! AND I still clocked in on time! I am grateful for this article. By nature, I am empathic, love to help, and oh no,… people pleasing…. been working on those boundaries. When I was a stay-at-home Mom recently, I said “yes” to so many things I felt too exhausted to do, because working mom-relatives would imply or say things like, if I were a staying home, I’d have time to do a, b, and c and open my own business, etc. and what are you doing? Can you watch my kids b/c I am too tired from work when I get home…. Anyhow, just started working and yes, it is tiresome, but I am more energized with the type of profession that I do, and I have more energy for my kids b/c they hadn’t drained me aaaaaalllll day. Yes, forgive me for such bitterness from feeling judged that a stay at home mom has the leisure of picking your nose whenever you can. And I admit I was manipulated out of guilt and obligation to take on family members things that standing up for taking care of myself. In short, thank you for this message! God bless you. I think you’ve written this book & series for me! Saying no–this is a message I SO need to hear!! My one word for this year is “boundaries” & I think saying no is the first step!